People don't that get using less fuel means we're more connected to each other and our communities. 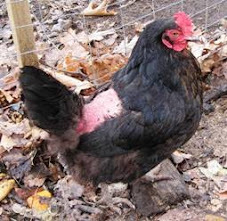 When I get chickens -- next week, I finally decided! -- I will get to know my neighbors better because I will sell them eggs and ask them to look in on the chickens when we're away. That's Tom Doherty, a chicken farmer in Westford, MA, talking to Denali and Bernadette (holding Leila) about chickens. The three of us women get together for Hen Talk, to share information and plans for what kind of birds to get, when to get them and how to take care of them. There are dozens of decisions to make, and we're helping each other. It's fun. At left are carpoolers. I made some wonderful friends by carpooling to work two to four days a week. I got to know people I never would have met through carpooling. They would make me laugh at 7 am and it insured that I almost always arrived at work in a good mood. At my Unitarian church we have fun washing dishes together after a pot luck dinner for 10 or 100 people. 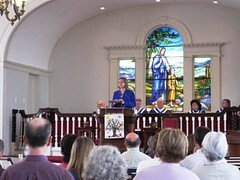 [Unitarians aren't regular churches. We must think for ourselves. Unitarian Universalists accept all beliefs: aetheism, Buddism, Christian, Jew or Pagan.] By using china plates and real silverware, we generate less waste. I belong to Ayer Local -- which is planning and taking action to transition when peak oil inevitability becomes a reality. We have fun together. I'm getting to know people in my neighborhood. What are you doing that's local and sustainable that connects you to your community? Apparently I am following you. ;) I have queued up in my drafts for my blog a post about how you meet people when you walk, that you would never meet if you didn't - fueled by some nice convos I've recently had when walking to pick Charlotte up from daycare. In fact, do I maybe walk by your house? If I do, maybe we could be on the list to come take care of your chickens! We've been getting our eggs over at springdell farms, and Charlotte now knows that eggs come from chicken's "bums or that general area" (I mean, she's only 2) because when I broke the news to her that chickens MAKE eggs, she said "No they don't, they can't, they don't HAVE hands!" Thanks for sharing your process, I'm excited to be an onlooker.